Double Figures ... 10 years has gone so quickly. Leroy is a huge Star Wars fan so we decided to do some Jedi Knight Training with his friends for the day. Leroy invited some of his best friends over for the day. 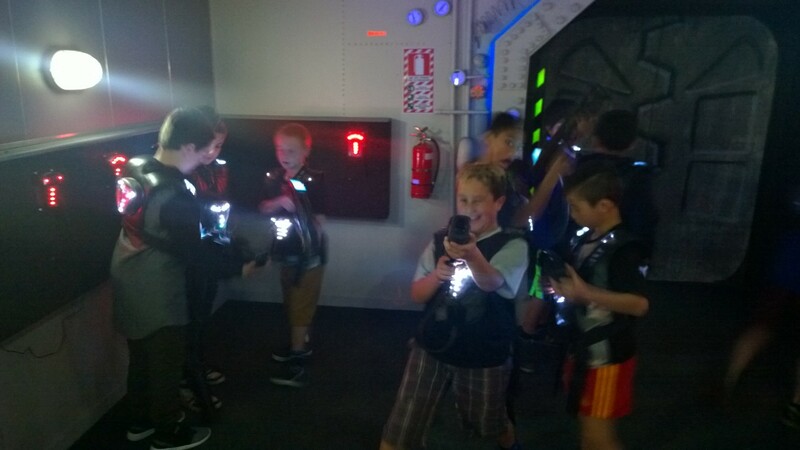 We met at Laser Strike for a couple of fun games then home for food, drinks and more Jedi training. 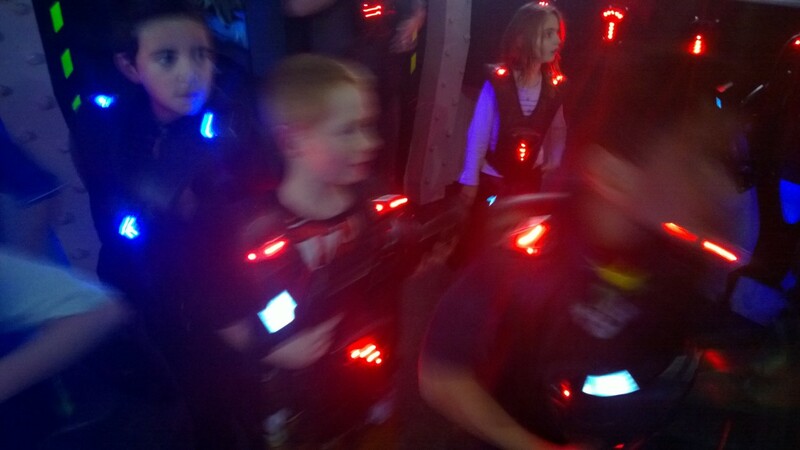 We all met up at Laser Strike for two games. I was so amazed at how well they all got on and helped each other out. After the first game everyone came out dripping wet so it was ice-blocks all round for everyone to cool them down before the next game. After the games were finished we pilled into our cars and went home for food and drinks. After looking on Pinterest and a few other birthday websites for some inspiration (since I didn't really know anything about Star Wars) I came up with so many ideas to make the birthday food fun for the kids. The Birthday Darth Maul Cake was made by a lovely lady I know 'CleverCookie'. 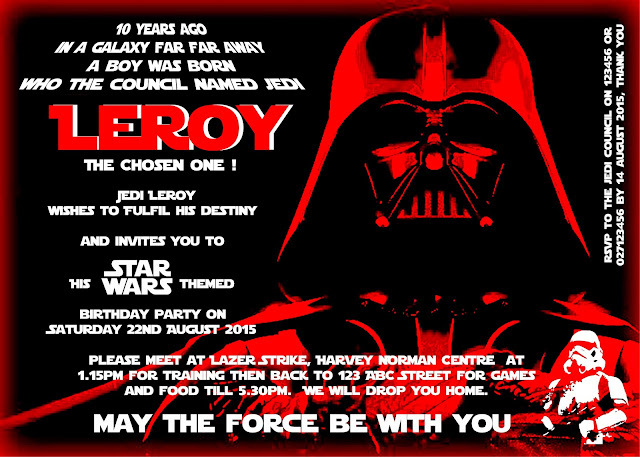 Darth Maul was Leroy's favourite character in the movies. I had two sets of PARTY plates that I like to use. Leroy asked me if I could make a Star Wars word out of the Letters. After a bit of research we could only come up with AT-AT. He thought this was great. After eating we went outside to do some more Jedi Training. First game was "Free Han Solo from the Carbonite'. Each boy had a frozen container ice with Han Solo buried deep in the containers. Using Forks and Knives they had to free Han Solo. 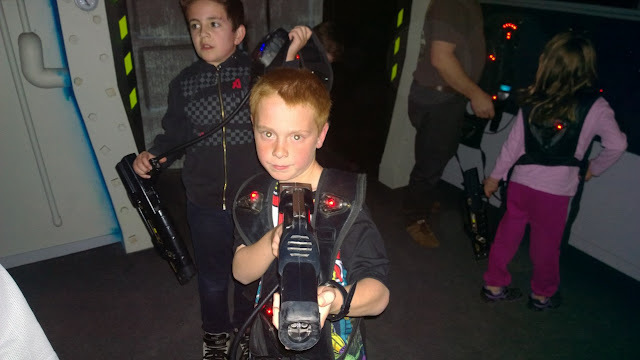 When he was free they went on to complete an obstacle course in a game called "Don't drop the Storm Trooper". (Egg and Spoon Race). First to finish got a Star Wars prize. Second game was "Find Darth Vader in the Galaxy"
This was a game we had previously made, we re-painted and re-branded the board. The object of the game is to throw Star Wars Angry Birds balls at the board to break the paper. The cup you break is yours which is either filled with lollies or if you are very lucky has Darth Vader in it that rewards you with a Star Wars Prize. Third Game we played was make a Light Saber. I had pre-cut Pool Noodles down to size for each child and made a sample for my daughter who was a bit young to participate. They all enjoyed cutting the silver duct tape to make a handle and decorating with black electrical tape to make the buttons etc on the handle. After making the Light Sabers they all had a huge Star Wars Duel. Great fun for a bunch of 10 year old boys. Fourth game was our homemade "Tie Fighter Pinata" filled with heaps of goodies for the kids. This year since they were a bit older was blind folded them all (using a blacked out Darth Vader Mask) so the game would last a bit longer. So funny seeing them all hitting the pinata. A little stress before the party.. oh no wheres the pinata stick. Inside for the fifth game - Pin the Light Saber on Yoda. I had found a picture on Google of Yoda, made the poster in photoshop for this game with light sabers with Jedi (Their Name) on the light saber. Last game before taking some very tired boys home was a Star Wars Quiz. Leroy was great with his knowledge and got all the questions correct. Jedi Knight Certificates for everyone for fantastic training. Time to take everyone home. 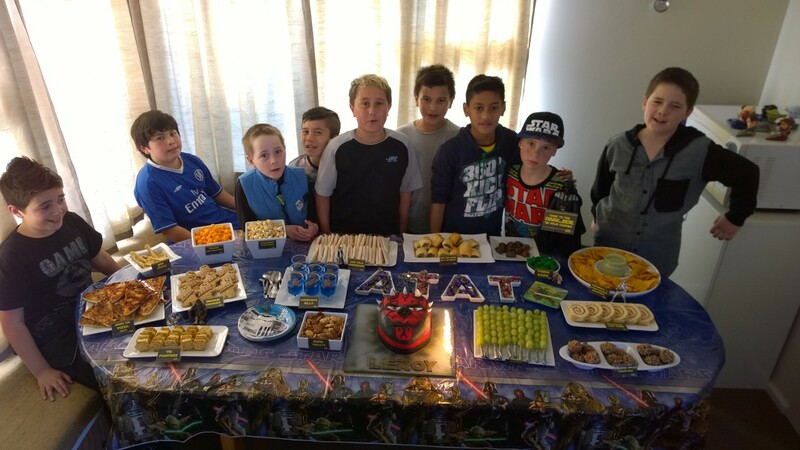 Each boy took home their Light Sabers, prizes, lollies and a loot box of Star Wars Goodies. Leroy's Origami C3P0 he made out of an activity book. Thank you to all Leroy's Friends for the wonderful gifts. What a wonderful birthday. For a mum who knew nothing about Star Wars I feel I have a great understanding of it now. I have seen the movies with Leroy and can't wait to see the next movie when it comes out at Christmas. You are an amazing boy Leroy and growing up into a really awesome young man. Hi Michele. Unfortunately I don't have the file anymore, just photos sorry. I had my hard drive fail a couple of years ago and that was one of the files I couldn't get back. I have never seen the picture again so couldn't make it again sorry.